Barrel: 10.5" chrome moly steel barrel. Chambered in 9mm, (9x19), with a 1/10 twist. The barrel is nitride treated for durability and finished off with a Palmetto State Armory 12" Slanted Lightweight M-lok free-float rail and a PSA Fluted Flash Can. Upper: Billet 7075-T6 A3 AR upper is hard coat anodized black for durability. These slick side upper receivers are made for us right here in the USA. Flash Can: Palmetto State Armory Fluted "FLASH CAN". This is a solid 6061 aluminum device that is designed to direct muzzle gases and the muzzle flash forward. Threaded 1/2-36 for 9mm. Black military-style hard anodizing. THIS DEVICE IS NOT DESIGNED TO REDUCE RECOIL, MUZZLE RISE, OR FLASH SIGNATURE. This device is designed to direct gasses and noise forward away from the shooter and enhance the weapon's appearance. Bolt Carrier Group: Gen 4 Hybrid 9mm BCG. Nitride treated 8620 steel, with enhanced firing pin and external 5.56 style extractor. The bolt carrier group is compatible with most aftermarket fire control groups. Will this work w a New Frontier armory c-9 9mm glock lower? What is the inner diameter of the hand guard for installing a suppressor? Will I need a heavier buffer to run this on ar15 pistol lower?. Just ordered the stern defense adapter. Will this mount to a standard AR-15 pistol lower? I have a current 5.56 pistol lower, and would be nice to be able to swap uppers w/out building a new lower. BEST ANSWER: Yes but you will also need a mag conversion block for Colt or Glock mags. Or MEAN Arms Endo mags which are pretty cool. Converts Pmags to 9mm with integrated ejector, and lrbho works too. Will this work with the 5Dtactical 80% 9mm Lower? 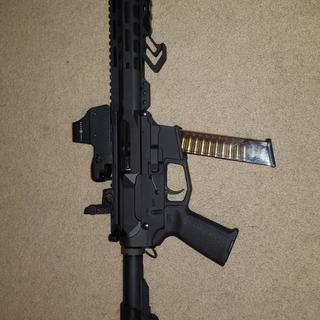 Will this upper function correctly with a Franklin armory binary trigger? Can anyone point or give me the sku number to the correct lower for this? BEST ANSWER: Will work with any AR15 Pistol lower with a magazine block adapter, or put it on one of the dedicated Glock or Colt Pistol lowers. Just don't put it on a rifle lower without a tax stamp. Will this fit on a spikes tactical 9mm Glock lower? Have around 500 rounds through it now with no problems. Great company and product. Worked well with 80% arms lower. Highly recommended!!!!!! Perfect! Fit and finish is great. No issues. Runs flawlessly.